The online version of this article (doi: 10.1186/1471-2164-15-1060) contains supplementary material, which is available to authorized users. The mechanisms of genome evolution are most often considered from the perspective of individual genes or gene families; there is nonetheless increasing evidence supporting the functional role and significance of events at a chromosomal (cytogenetic) level . To date, bird genomes remain relatively understudied from an overall genome organization perspective; however, the recent availability of multiple avian genome sequence assemblies  allows us to consider the role of chromosomal change in the evolution of Aves from their dinosaur ancestors. Chromosome rearrangements between species can cause or reinforce reproductive isolation through reduced fitness of hybrid offspring due to a compromised ability to synapse and segregate chromosomes at meiosis [3, 4]. Moreover, reduced interspecific recombination in rearranged regions is thought to promote the accumulation of incompatibility loci in such regions [5, 6, 7]. The purpose of this study was to gain further insight into the mechanism of bird evolution through the multiple comparative analyses of chromosomal segments and breakpoints. Using chicken BAC clones, studies provide a low-resolution appraisal of intrachromosomal rearrangements between chicken and other species [12, 13, 14] (turkey, duck, zebra finch, respectively). This approach, however, is limited in its ability to identify the molecular coordinates of evolutionary breakpoints. The availability of whole assembled genomes [15, 16, 17] allows comparative genomics at a much more detailed level of resolution than can be achieved by cross-species FISH. Burt et al. were the first to use bioinformatics to define inter-species analysis of whole avian chromosomes at a genomic level (chicken-human). 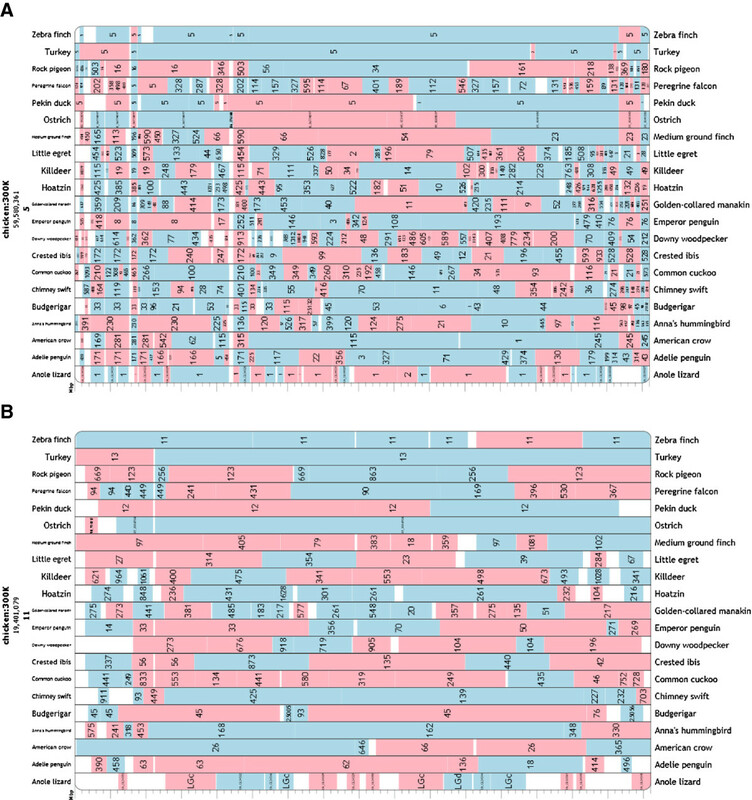 The publication of the chicken genome sequence  provided more detailed information, establishing conserved synteny between chicken and human whole genome assemblies. In the ten years since, only conserved synteny comparisons have been made between the chromosomes of two [14, 19], or at most three [20, 21] avian species. The use of whole genome assemblies to study cytogenetic phenomena has raised interest in the study of comparative cytogenetics from the perspective of evolutionary breakpoint regions (EBRs) and homologous synteny blocks (HSBs). To date, the majority of such studies have focused on mammals , however, analysis of other groups, such as birds, is essential in order to establish whether mammalian systems are representative of, or an exception to, general patterns observed in other animal groups. Larkin et al. found that, in mammals, EBRs can lie in gene-dense regions. In the human genome EBRs also lie in regions with more zinc finger protein genes, more genes whose function is associated with environmental stimulus response, as well as more segmental duplications, CNVs, SNPs and retrotransposed genes. Such “EBR genes” appear to be related to lineage-specific biology and adaptive features [22, 23, 24]. EBRs are also frequently reused, i.e. there are regions of the genome that are prone to chromosomal breakage leading to translocations, inversions and fissions [25, 26]. 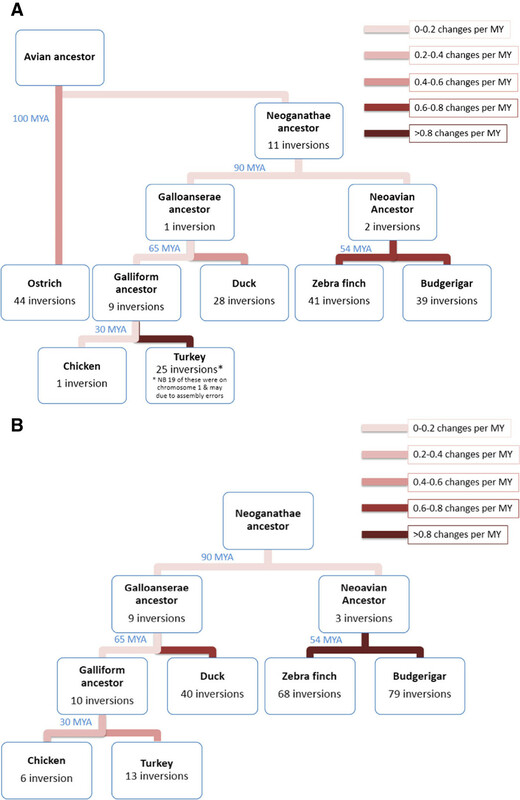 Comparison of sequence assemblies in chicken, zebra finch and turkey suggests that breakpoint reuse is higher in birds than in mammals [20, 21]. The data in birds also suggests a key role for recombination-based mechanisms in the generation of chromosome rearrangements in that EBR location is consistent with elevated levels of genetic recombination at these loci . This is consistent with the notion that, if recombination drives chromosomal rearrangements and assuming an evolutionarily conserved recombination landscape [27, 28, 29], EBRs might be enriched in genomic regions with elevated recombination rates. Not all species show an association of chromosomal breakage and elevated recombination however, e.g., insects [30, 31] and mammals. Indeed, in mammals Larkin et al. suggested that the highest levels of recombination are located between the EBRs rather than in association with them. 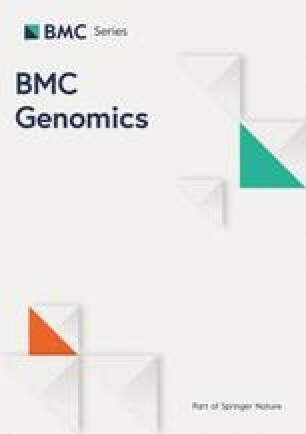 Reconstructions of scaffold-based assemblies also relied, in part, on previously published zoo-FISH (BAC and chromosome painting) data for the macro- and microchromosomes of chicken, turkey, duck and zebra finch [12, 13, 14] as well as newly generated data in this study as follows: we used seven new chicken microchromosomal paints A–G , verifying their assignments with chicken BACs (see Additional file 1) by dual color FISH and painting them onto ostrich and budgerigar metaphases. For chicken, turkey, duck and zebra finch, zoo-FISH has been previously described [12, 13, 14]. For ostrich, no further differences between this species and chicken microchromosomes were found (Table 1 and Figure 2). 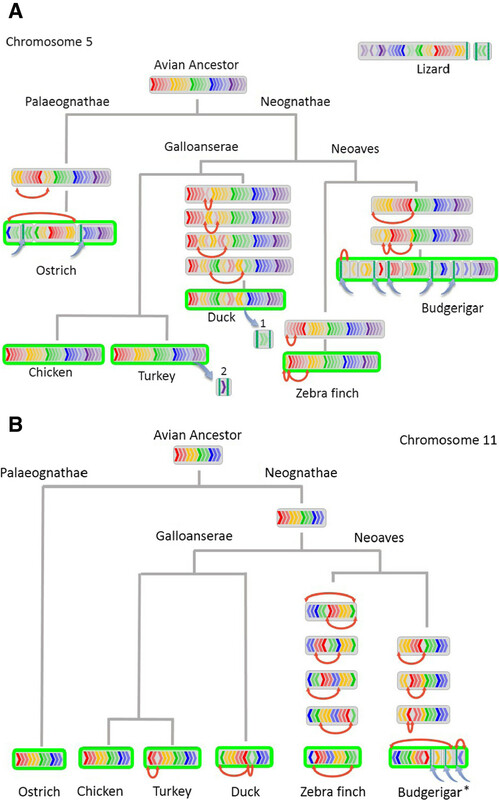 For budgerigar, analysis reveals a more complex pattern incorporating several of the microchromosomes, namely six hitherto undescribed fusions (Table 1 and Figure 2). For chicken, turkey, zebra finch and duck, inter-macrochromosomal changes have been previously described, i.e. chromosome 4 fusion for chicken, chromosome 2 fission for turkey, chromosome 1 fission for zebra finch, and no changes in duck [12, 13, 14] in these four species. In the current analyses, however, results suggested that there were at least 26 interchromosomal differences between chicken and ostrich, and 40 between chicken and budgerigar for all chromosomes (Table 2), with the changes in the budgerigar lineage occurring since the passeriform-psittaciform divergence (~54 MYA). 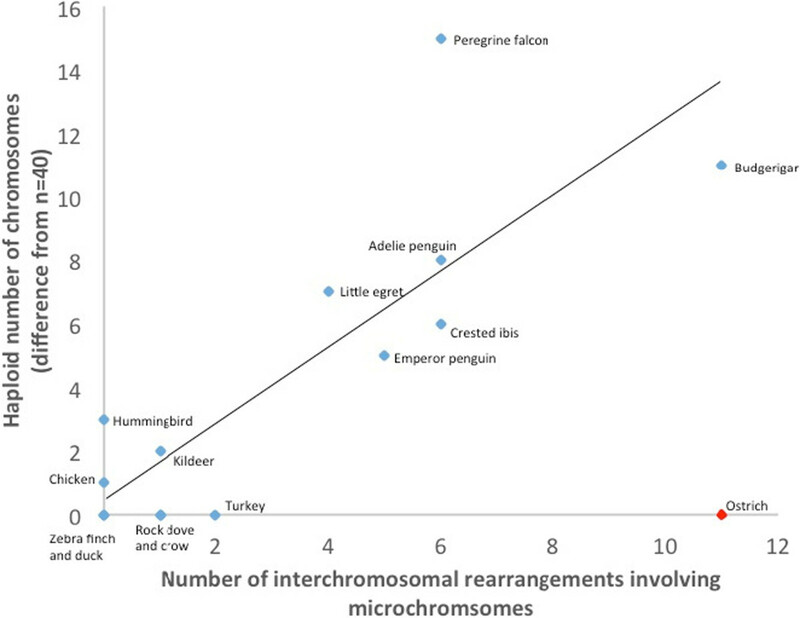 Considering microchromosomes alone and using data pertaining to numbers of interchromosomal rearrangements for the remaining 15 species , results suggested that microchromosomal rearrangement was rare, except where the species of interest had been previously known to have an unusually large or small number of chromosomes (Table 3). In other words, as illustrated in Figure 6, there was a statistically significant correlation (R 2 = 0.3; P = 0.03) between number of interchromosomal rearrangements and published deviation from a haploid chromosome number of 40. The exception to this “rule” was the ostrich (2n = 80), with 26 interchromosomal differences, 11 involving the microchromosomes, results suggesting significant rearrangement while maintaining the overall karyotypic structure. Indeed, if ostrich is excluded from the analysis outlined in Table 3 and Figure 6, the statistical significance of the association increases markedly (R 2 = 0.7, P = 0.0002). Earlier cytogenetic data suggested that, for the majority of bird species, karyotypic patterns are broadly similar to one another [9, 11, 14, 20]. This purportedly extends to ratite birds [42, 43, 44]; however, further analysis presented in this study challenges this notion. That is, we identified 26 interchromosomal rearrangements in ostrich compared to the ancestor. Moreover, the question of whether the conserved interchromosomal synteny seen in the macrochromosomes applies to the microchromosomes has hitherto been beyond the resolution of contemporary methodology. This study is the first to classify inter-microchromosomal rearrangements in any species; we provide evidence that interchromosomal rearrangements are nonetheless rare, except in cases (around 1/3 of species) where we already knew that karyotypes were highly rearranged . Ostrich is the exception and it will be interesting to note whether this applies to other ratite birds. The positions of CARs and HSBs or SFs within each species genome were noted, allowing correlation with our previously published FISH based physical mapping data in chicken turkey, duck and zebra finch [12, 13, 14] and that derived by cross-species chromosome painting in former publications [66, 67] and in the current study. 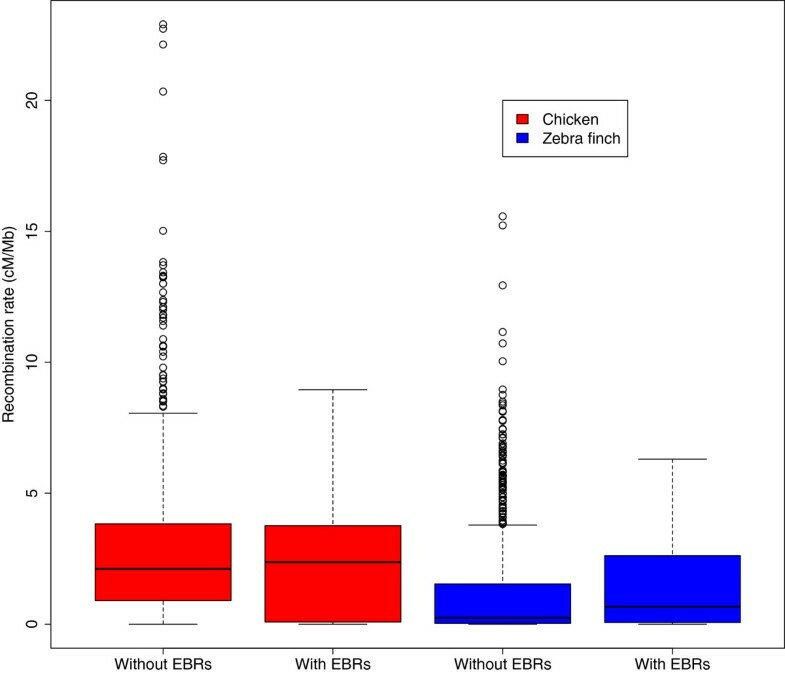 These data were previously acquired by cross-species FISH of chicken BACs and chromosome paints onto turkey, duck, ostrich and budgerigar chromosomes, and same-species FISH of orthologous zebra finch BACs onto zebra finch chromosomes.